Launching a new website or redesigning your existing one is an investment that requires proper preparation to ensure a successful outcome. Web designers typically require all design and other raw materials before the start of a project. Over the 20 years in the web design business, I’ve come up with a list of the most important assets to ensure that your project starts on the right digital foot! It sounds simple, but in many cases it isn’t! Although you see your logo on your business cards, on your previous website, and other collateral material, you may not have the proper format readily available for your designer. JPG, TIFF, BMP: JPG, TIFF, BMP: If you supply your logo in any of these formats, then the file needs to be large – about 1000px wide, 150dpi resolution – so the designer has enough “detail” to work with. The file will be resized and optimized for web use. PDF: In some cases, supplying your logo in a PDF file may be sufficient. A quick way to find out if your PDF file might qualify is to open the file in your PDF reader, then keep enlarging the view (“zoom-in”) and see if the logo quality drops down. If image quality stays the same even as you zoom-in, then your PDF file should be good to go. PSD: If you already have your logo in the popular Photoshop format, you are (almost) there. It will be usable only if the logo image is separate from the background inside its own layer(s), and the file is in high-enough resolution – say 500px wide (dimensions of the actual logo graphic itself) at 72dpi. EPS, AI: This is the ideal format to send your logo in! This vector graphics format ensures that the logo can be placed on any size, on any background without losing quality, and can be easily manipulated further for re-coloring purposes, create 3D effects, and anything else your new web design requires. Please don’t forget that your logo is a graphic that will most likely appear on every page of your site. Therefore, it’s critical to optimize the image for speed. In nearly all cases, your logo will be re-processed for web use into the PNG format, which offers very effective compression, small file sizes and outstanding image quality, especially for logo designs which naturally use very few colours. At COMMbits we take care of such image resizing along with a myriad other “details”, during our all-inclusive web design and development service. Your website marketing pitch must encapsulate everything you do in a concise, creative, and compelling way. It usually goes high up inside a web page, perhaps close to your logo, or in other prominent places inside your website. Keep in mind that here at COMMbits we use your tagline frequently during our initial SEO Service and Digital Marketing initiatives. #3. Decide on your list of master keywords/keyphrases. During the initial phase of a web design project, a summary list of keywords and keyphrases is all we need. Once we have your master list, we perform a keyword analysis that will help us zoom-in and find the variants of your keywords and phrases that are expected to create higher search traction in your business vertical. 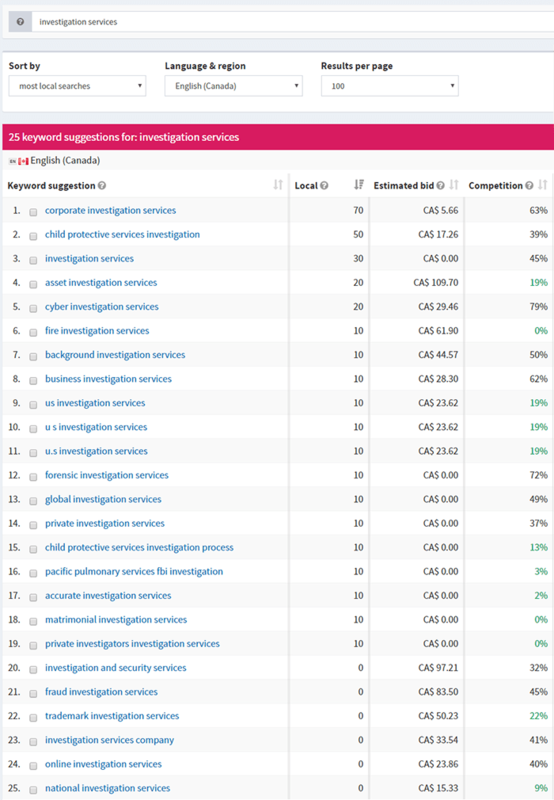 However, “corporate investigation services” yields 70 searches, with a 63% competition ratio. 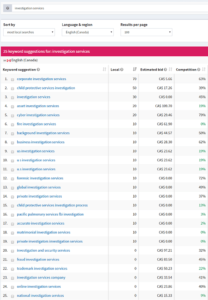 In other words, it will be slightly more difficult to beat the competition for “corporate investigation services” but if we get there, the page will receive 133% more traffic. Also, “corporate investigation services” is a superset of “investigation services”. By targeting the former, we are also targeting the latter. Two birds with one stone! The way we use keywords is part our SEO Services formula; you can see a broad view of the process at the bottom of our SEO Services page. #4. Verify access to your domain name and web host. – Who is your current domain name registrar? You can verify this easily through a public “whois” service, such as www.whois.com. Just type your domain name, and read the “Registrar” entry. – Verify you have access to your Registrar: Username, password. Please confirm they are current and valid by attempting to login yourself. Once you supply us with the above information, we will be able to manage your domain on your behalf. Of course, you can always remain the registrant of your own domains. Although we do provide an all-inclusive service web design service (business web hosting included), a very small number of clients opt to use their existing web host, mainly because they are “locked” in a long duration contract with another provider. We highly advise against such action; a 3rd party web host adds a highly unpredictable component outside of our control. This situation creates several security and performance problems and interferes with our ability to offer you top-level web maintenance and support on a continual basis. Mainstream Web Hosting for Small Business. Beware of the gimmicks! Our business web hosting environment provides separate and dedicated database and web servers, firewalls, security, multi-CPU cores, large server memory, tightly-controlled shared space or dedicated web hosting, and caching methodologies. This gives your website the power of performance without the headaches of dealing with multiple vendors. In case you must host with a third party commercial web host, then check out WHSR’s list of hosting reviews. Founder of WHSR Jerry and team have tested more than 50 hosting services and publish host reviews based on uptime and site speed record. #5. Find or create new photos and staff bios. Good quality photos are critical for any modern web design project. Staff photos with their bios are also important to have beforehand. Consider photos at the place of work, or your products, if you are selling something online. We offer professional photography and video services for Toronto clients, taking the guesswork out of the equation and building your custom photo portfolio according to the requirements and objectives of your web design project. No matter what you say about your own business, nothing is more effective than showcasing testimonials from your clients. Search your email and other document archives for comments from your clients. Or go out ask them individually for their testimonial and permission to use it on your new website. Attaching their photo also works. Don’t worry about preparing their photos for the web. Here at COMMbits work such as optimizing, resizing, re-coloring or cropping photos is part of our all-inclusive web development process. #7 Prepare 3-4 blog posts (if you are building a blog). If you decide your new site will have a blog, don’t launch your site without any blog posts! Ideally, you want to prepare 3 or 4 posts for launch. Make sure you have a blog-writing strategy in place so that you keep supplying your blog with fresh content on a consistent basis. Blog writing is pivotal to our Digital Marketing program and if you require authoring help we do provide a professional web content copywriting service which includes blog writing. #8 Decide which emails to send your funnel-leads to. An integral part of your new web design should be to develop web contact forms for lead generation throughout your new site. You may choose to have leads sent to different people at your end, separate for each origin web page inside your website. Please choose where to send your leads. #9. Confirm your email accounts are in good standing. Ensure that all your email accounts and email aliases are active and in good standing prior to launching your new website (i.e. not over-quota, immediate accessible via mobile, spam-controlled). If you are frustrated with your existing email service, losing messages, mobile devices not syncing properly, and your mailboxes are littered with spam, or even if your domain name has been blacklisted, we have a solution. With our Outlook Business Email service we offer a reliable solution for your critical business communications. The launch of your new website is a grant opportunity to upgrade your email, messaging and calendaring system as well. #10. Summary of your services, products, corporate profile, etc. Create a document (no special formatting required) with a summary of what you would want included in your site. This information will help your designers build a foundation for your site. Include a description of your company, your services, your contact information, your team and staff – in short everything that best describes your company. If you have any brochures or other marketing material, please provide them as well. Time to Refresh – Rethink – Get up-to-date! Now is a great opportunity to browse through your existing pages and see if something dramatic has changed in your offerings, i.e. new services or products, or ones that you do not offer any more, updated staff listing, etc. Please share your own experience! I can not profess that this is a conclusive list! The subject of web design and development is vast and complex so the way one prepares carries a substantial weight as to the success and timely delivery of the project. Certain items may be important to some, but insignificant to others. 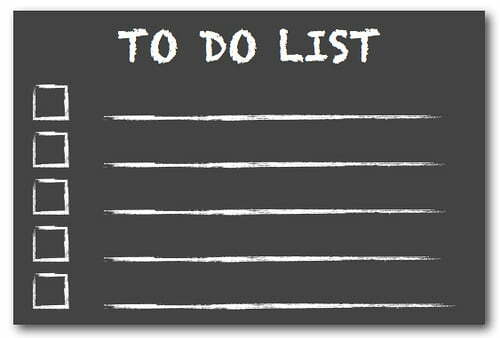 Do you find this list helpful? Is something you consider important missing? I’d love to hear your own experiences below or what you value the most from the list above.